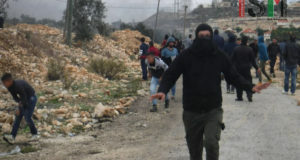 The eight youths arrested and held following the night raid in Kafr Qaddum have court on the 15th May, at Salem Court, near Jenin. 14 people were arrested in Kafr Qaddum during a night raid on the 11th to 12th of May, six of them were released the same morning. At around 12:30AM, the Israeli army arrived at Kafr Qaddum with approximately 35 jeeps and about 100 soldiers, they entered houses to arrest people, while harassing the residents. During the night raid, some of the villagers tried to prevent the arbitrary arrests. 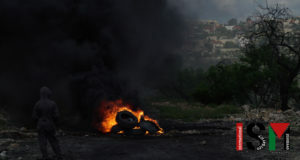 The Israeli army responded by shooting tear gas canisters and stun grenades, consequently clashes erupted between the invading Israeli forces and youths from the village. 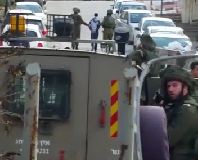 Witnesses reported that the Israeli soldiers walked behind the detainees, using them as human-shields. At around 2:00AM, the Israeli army stormed into Kamel Ibrahim Barra Wahlid’s house, a member of the Union Council. As he recalls, while the army tried to arrest his two sons, he resisted the army’s intrusion in his house and was then beaten throughout his body and on the head. The Israeli army finally arrested two of his children: Sami Mofid Kamel Barham, 21 years old, a student that would have had his last exam in these days, and Wasim Kamel Ibrahim Barra, 19 years old, released the same morning he was arrested. Wasim was hit in the head by a tear gas canister a year and a half ago. It was shot from a distance of 15 meters, and had caused him serious brain damage and as a consequence he lost his speech ability. The raid ended at around 3:30AM with the detention of 14 people, 6 of them were released the same morning while the other 8 are currently under Israeli custody in Huwwara’s military base. According to local sources, the arrests are targeted at people that usually participate at the weekly demonstrations, in order to intimidate villagers. 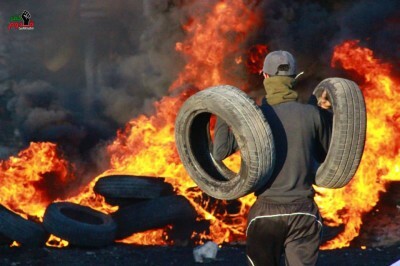 As a witness concluded: “Everything is done to stop our demonstration, but the army will never succeed in stopping us”.